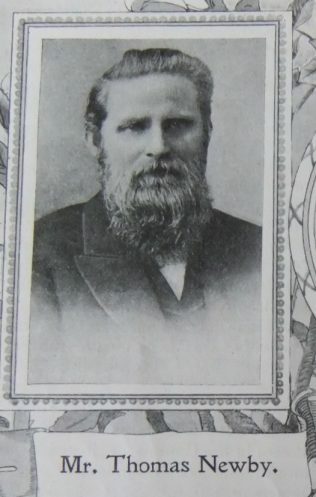 Mr. Thomas Newby, the Senior Steward of the Sunderland First Circuit is a primitive Methodist of the third-generation, and has spent the whole of his life in connection with the circuit. For over thirty years he has filled the responsible positions of local preacher and class leader; for over twenty years he has been Circuit Steward. In earlier life he worked hard in the Sunday School and has done yeoman service in at least one difficult chapel-building enterprise. His brethren have not overlooked his worth, for he has been delegate three times to District Meeting and twice to Conference. He was for several years a member of the Sunderland Board of Guardians but his deepest interest has always lain in his own church. For four generation now the family to which our friend belongs has been conspicuous in every kind of service – may its bow long abide in strength! Thomas was born on 3 July 1846 at Washington, Co Durham to parents William Hunter Newby and Isabella Jane Ramsey. William was a tailor and local preacher. Thomas continued in his father’s trade as a Tailor and Draper. Thomas married Jane Turnbull (1842-1927) on 22 February 1871 at Sunderland, Co Durham. Census returns identify three children. Thomas died on the 23 April 1910 at Sunderland, Co Durham.